The Blogging Authors Reading Project started a couple years ago and I'm going to continue in 2012. I have discovered quite a few authors who blog and enjoy reading new to me authors. I have been following a few group author blogs and made it a goal to read at least one of each of their books. Hence the Blogging Author Reading Project. 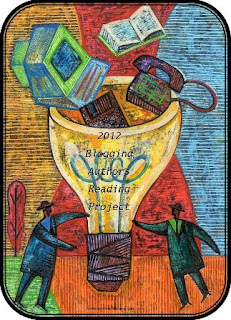 The goal is simple - to read books by authors who blog. I'll be starting with the books I already have in the stacks since one of my goals this year is to whittle down my current TBR pile. From the old and current guard on Murderati, I've already read stories by Toni McGee Causey, Louise Ure, J.D. Rhoades, Tess Gerritsen, Robert Gregory Browne, J.T. Ellison, Alex Sokoloff and Allison Brennan. Other group blogs include The Kill Zone, Murder She Writes and The Deadline Dames. I'll be exploring their books as well. These are just a few of the blogging authors I have on the shelves. Will most likely be adding more over the next year. Do you follow any blogging authors? Jump right in and join me. I always mean to follow some authors blogs but I just never do!! For you though I could totally understand the attraction! !